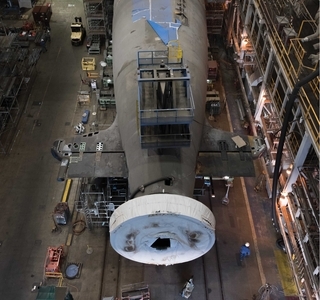 What: Media are invited to attend a celebration to lay the keel for the Virginia-class submarine Delaware (SSN 791) at Newport News Shipbuilding. The ceremony is not open to the public. Who: Dr. Jill Biden, wife of Vice President Joe Biden, is the submarine’s sponsor. Ceremony participants will include Newport News Shipbuilding President Matt Mulherin and Navy and government representatives. HII will provide a live, multi-camera satellite broadcast of the keel-laying ceremony in its entirety. Satellite coordinates are below. Where: For Friday’s and Saturday’s events, media will park in designated spots in the second-shift area of Newport News Shipbuilding’s North Yard parking lot (see directions below). Media will be transported by bus to and from the site. The event will be held outside the Supplemental Module Outfitting Facility (SMOF). Please note that this is an industrial setting. Long pants, shirts with sleeves covering shoulders and flat, sturdy, closed-toe shoes are required attire. 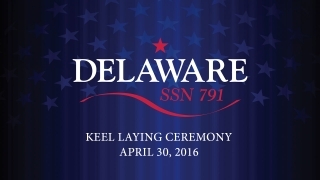 HII will use #SSN791 and #USSDelaware as the social media hashtags for this event. An online press kit for the event is available at: http://newsroom.huntingtoningalls.com/presskits/delaware-ssn-791.